Micah's CDH story began on January 19, 2018 at our 12-week sonogram. We had opted to do the noninvasive genetic screening, which was comprised of blood testing and an anatomy scan. The scan seemed to take a long time, but our technician told us it was because he was wiggling, and she was having difficulty getting good measurements. Another technician came in to try to get some more images and said that they were going to have the doctor take a look at everything before we could be cleared to leave. Neither technician seemed too alarmed, so my husband and I simply chatted while we waited to get the green light to head home. Our technician entered the room (with a box of tissues) followed by the doctor. It was in that moment that my stomach dropped to the floor, and I knew that something was terribly wrong. She explained that everything looked good with his spinal fluid; however his stomach was not where is was supposed to be. At just 12 weeks gestation, our son's stomach was already parallel to his heart. We were told that he had CDH and that the national survival percentage for this defect was just 50%. Our options, including termination, were outlined. We explained that neither an amniocentesis nor termination would be necessary. Defect or no defect, this was our baby, and we were its parents. As scary and gut-wrenching as the unknown was, we were fiercely in love with this child and were determined to carry and fight for him for as long as we could. Desperately trying to find some comfort from our heavy grief, we scoured the internet late into the night reading any medical journal article we could find on CDH, genetic anomalies associated with CDH, and FETO. We researched all major children's hospitals in the U.S. in an effort to find a medical team that boasted promising success rates. But with each hour that passed, our anxiety heightened, and our hope faded. After hours of reading medical journals and not liking what I saw, I threw a research "Hail Mary" and decided to search YouTube to see if any parents had posted a survival story about CDH. Adam Zolman's video was the first one that popped up. I immediately knew that Dr. Kays was different than any other physician we had researched, and I knew deep in my gut that our baby's best shot was going to be with him. I remember telling my husband something to the effect of, "I don't know how we are going to do this, but we have to try to get to this guy.” But how? Relocating from California to Florida seemed like such a pipe dream. How could we afford that? What were we going to do about work? My insurance wasn’t covered in Florida so how would this even be possible? Florida was obviously our instinctive choice, but we honestly had no idea how we were going to make it happen. I decided to reach out to Dr. Kays via the Tiny Hero website just to make sure I had at least exhausted the option. I received a call from Joy Perkins not 20 minutes after submitting the inquiry form. I was stunned at the response time and cried through our entire hour-long conversation. That phone call was probably one of the most important events in all of Micah's CDH journey. It's important to note that, prior to speaking to Joy, we had been contacted by two physicians, a genetics counselor, and even a grief counselor from our local hospital. All of them were so kind, but it seemed to me like they were talking to me like Micah was already dead. Joy was the first person I spoke with who had confidence in her voice. She was sympathetic but certainly not defeated by Micah's diagnosis, and THAT was the type of person/team I wanted caring for my son. Researching other programs closer to home would no longer be necessary. The hope I felt from that phone call snuffed out any doubt in my mind about tackling the minutia of relocating. Yes, we were going to have to make some pretty big life changes, but we were going to Dr. Kays, and that was that. The overwhelming support of family, friends, employers, and the CDH community coupled with many, many miracles sprinkled throughout the next five months enabled us to relocate from California to Florida in preparation for Micah's arrival. God’s hand was so evidently involved in every step of the way. Micah was born on July 17, 2018 via C-section. We knew from our consultation with Dr. Kays at 26 weeks that Micah was an extremely severe case with an 85% chance at survival. Therefore, you can imagine our surprise when we heard his little CDH war cry when he came out! He was placed on ECMO at 3 hours old, had his repair surgery within the first 24 hours of life, and also wound up having emergency abdominal patch surgery within his first 48 hours. He was missing 95% of his left diaphragm, had 45% liver up in addition to all large and small intestine, all stomach, and all spleen up. His lung volume was 18%. 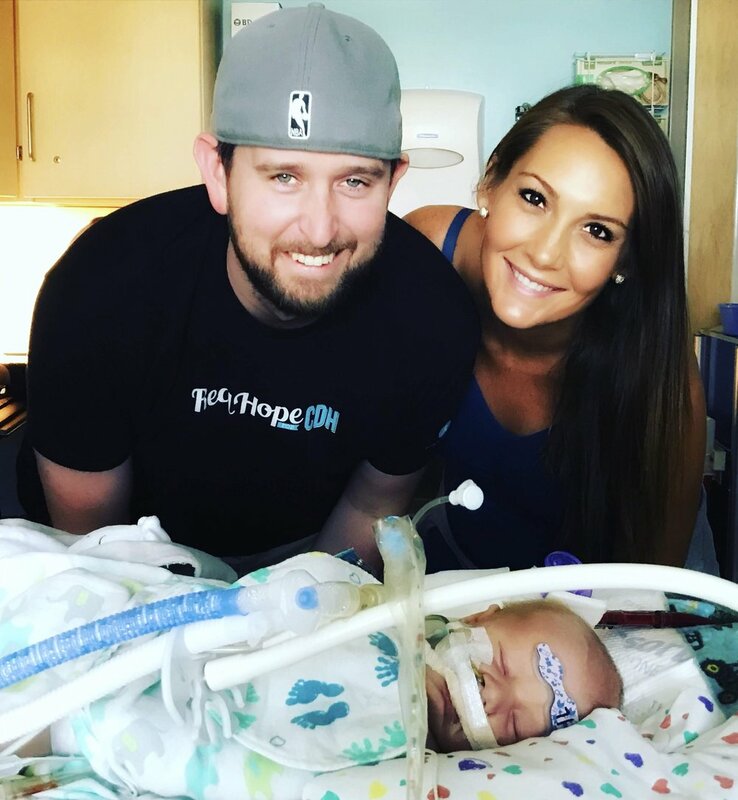 He spent 15 days on ECMO and 28 days on the ventilator. His genetic screenings came back normal, confirming that this was an isolated CDH case without any other compounding anomalies. We held our living, breathing baby for the first time on Day 29- truly a moment neither of us will ever forget. Micah had the Nissen and Gtube surgery in the months that followed. He spent a total of 79 days in the hospital and was home in California by mid-October. None of our doctors in California can believe how well Micah is doing-given his story. He is a happy, healthy, intelligent 6.5-month-old baby boy who loves to eat, laugh, smile at anyone, and be outside. He has therapy three times a week to work on his gross motor skills. Other than that, he is meeting or exceeding all age-appropriate milestones. 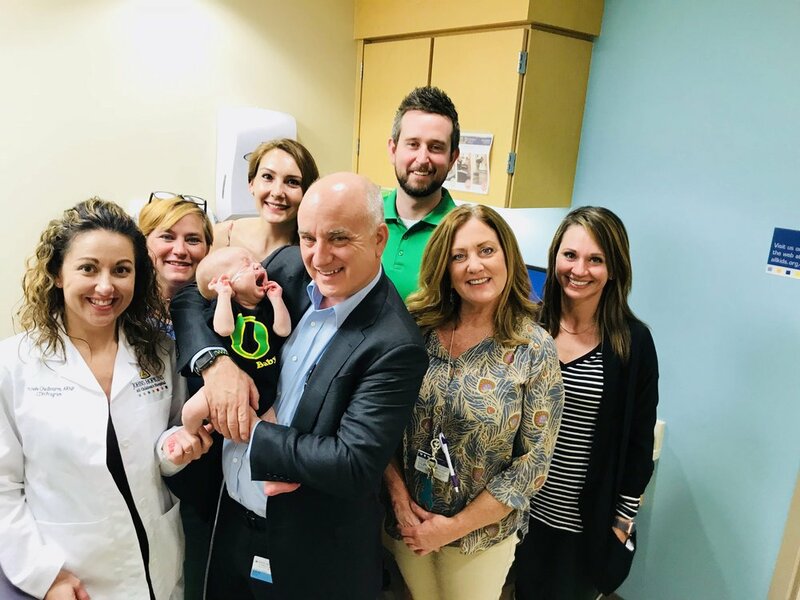 The care that Micah received from Dr. Kays, Joy, Rachael, Michelle, Stephanie, Dr. Stone, Dr. Go, Pam, and the rest of the CDH team was truly incredible. They delivered on every expectation they set with us, and graciously put up with my sleep-deprived, hormonal, whack job of a petrified first-time mom personality for 79 days (quite the accomplishment in and of itself). We will forever be indebted to them for saving our son's life and look forward to many annual check-ups so that Micah can get to know the team that got downright scrappy with his CDH. It wasn't too long ago that I sat at my desk at work silently crying as I read these survival stories over and over again hoping that Micah's story would one day be among them. I acutely remember the knot in my stomach and the hours of lost sleep I experienced as I wondered if my son was going to survive. CDH is a long, terrifying, sad, and HARD journey, but it's certainly not an impossible one. There is SO much hope for your precious baby. My husband and I are committed to helping CDH families however we can and will always be happy to talk to you if you have questions or just need someone to listen.